Enjoying the outdoors on a summer evening can be hard if you’re constantly trying to swat mosquitoes. These pesky insects are not only annoying but can also carry serious diseases. Protect yourself and your family with Mosquito Patrol from Lawn Masters! Depending on your property, Lawn Masters has a couple of different options for getting rid of mosquitoes. They like to live in the plants around your yard, so our technicians will use a fogger to fog the underside of all your plants and trees to kill any mosquitoes living there. The fogger works similarly to a leaf blower and dries quickly. If you live near water, like a pond or river, we will also treat the grass and any other landscape you have. Mosquitoes thrive near water, so we have to take extra steps to treat properties with water. Even if your property does not have any bodies of water, living just a mile or two away from water can bring more mosquitoes to your yard. We will work to create a custom solution to get rid of mosquitoes in your yard. Our technicians will come out and treat your landscape once a month. The program usually begins around April and lasts every month until September. Sometimes, the weather may cause the mosquito season to last longer. We also often do an extra month of treatment for properties near water. The treatment is guaranteed all month until the next month. If you start noticing a problem between treatments, our technicians will come back out and reapply at no extra charge. Spend the summer enjoying your backyard again knowing that Lawn Masters is looking out for you. 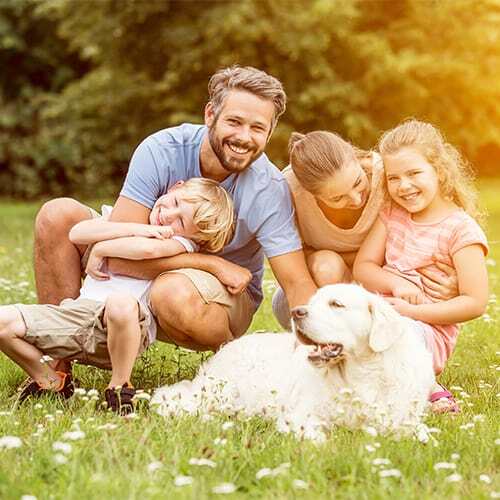 People often worry about the safety of the mosquito treatments, but Lawn Masters only uses residential grade products made to have contact with humans and pets. The products are diluted and mixed before we go to your home, so you will have no contact with undiluted products. We are dedicated to using only treatments that are safe for our customers and their pets. What else can I do to keep mosquitoes away? In general, you want to get rid of any standing water in your yard. This includes keeping your gutters clean so water can flow smoothly and filling in any low spots in the yard where water tends to linger after the rain. Getting bitten by a mosquito isn’t just itchy – mosquitoes can carry dangerous diseases like West Nile Virus and Zika. West Nile Virus is spread by mosquitoes and symptoms usually take 3-15 days to appear. Symptoms include fever, neck stiffness, and head and body aches. 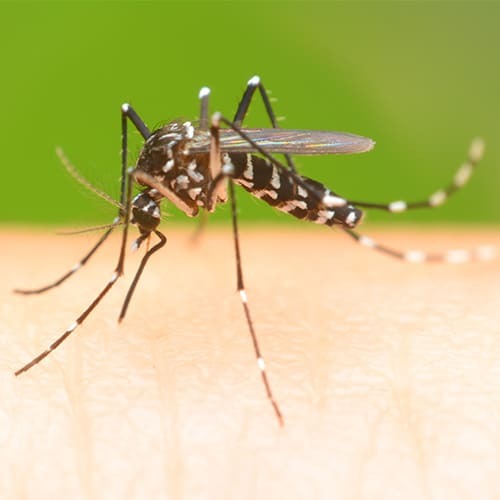 While most cases are mild, West Nile Virus can sometimes become serious and even fatal. People over the age of 50 or with weakened immune systems are most at risk. The Zika virus is another serious mosquito-borne disease. Most people will not experience symptoms, but those that do have fever, rash, and joint pain. Although most people who contract Zika do not have severe symptoms, it can cause dangerous birth defects if a pregnant woman is bitten by a Zika-carrying mosquito. Thankfully, the mosquito species that carries the Zika virus has not been found in Indiana yet. However, the disease could potentially spread, so it is important to be prepared and take steps to protect yourself and your family.